Song is an emphatic “peet-sa,” with the second syllable is accented. 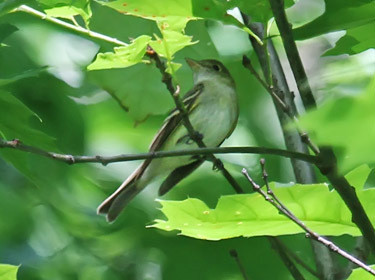 Olive above with variable underparts, most birds show a pale grayish throat, pale olive wash across upper breast, white lower breast, and yellow belly and undertail coverts. Yellow eye ring; two buffy or whitish wing bars; and very long primaries. Lower mandible is mostly yellow, and the bill is proportionately long and broad-based. 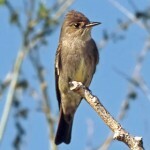 Juvenile is brownish-olive above; wing bars are buffy; and underparts are whitish with olive wash on breast. Habitat: Found in shady and humid riverbottom forests, forested swamps, and wooded plains. 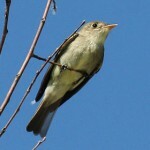 Where in Nebraska: Rare regular spring migrant in the southeast, rare to casual elsewhere. Rare regular breeder in the southeast. Hypothetical in the fall. Field Notes: Range appears to be expanding in the northeastern United States. 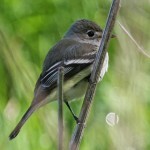 Fun Facts: The male Acadian Flycatcher defends his territory with a “peet-sah” song.